Photographing Iceland – Is It Really That Good? Iceland seems to have become the new “must-visit” destination for landscape photographers, especially from the UK, since it’s only a couple of hour’s flight away. But you may be wondering – is it really that good? And the simple answer is, yes. The dramatic landscape is ever changing, epic in scale and often alien in appearance. It’s (whisper it quietly) my favourite place in the world. Along with the amazing waterfalls, glaciers and geothermal areas, it’s a visual feast just to drive around, which can easily turn a 1 hour drive into 3 with all the places you’ll want to stop for photos. But as I learnt from a recent visit, the whole world seems to have discovered Iceland too, and once tranquil locations are now packed with tourists. Although this takes a little of the shine off the experience, it’s still an amazing place to visit and there are plenty of locations off the beaten path that the masses haven’t yet discovered. Yes, the weather can be a bit fickle, but it changes all the time so shouldn’t be too much of a problem as long as you can be flexible with your itinerary. I’d highly recommend it to any landscape photographer – you won’t be disappointed. Anyway, I’m sure you’re hoping for a list of photography locations. Well, here’s a short list of great locations I’ve personally been to, but I’ve also included three that I know about but haven’t managed to get to (yet). Geysir – bubbling hot pools of water and erupting geysers… what’s not to like. Gullfoss – an epic twin cataract waterfall just along the road from Geysir. Seljalandfoss – a tall single-drop fall you can walk behind, just off the ring road between Sellfoss and Vik. Skogafoss – a huge single drop waterfall, just off the ring road between Sellfoss and Vik. Vik – a black sand beach with spiky sea stacks just offshore. Dyrholaey – a small promontory near Vik, with views from lower down to the sea stacks at Vik and generally amazing views in all directions from the top. Svartifoss – an elegant single drop waterfall surrounded by basalt columns, just a short walk from Skaftafell visitor centre. Svinafellsjokul – amazing viewpoint over a glacial tongue, easily accessible by car just east of Skaftafell. Jokulsarlon – the glacial lagoon. A classic location. The Ice Beach – huge chunks of ice glimmering on a black sand beach, on the other side of the road from Jokulsarlon. Stokksnes – Epic views over a black sand beach to Mt Vestrahorn, just east of Hofn. 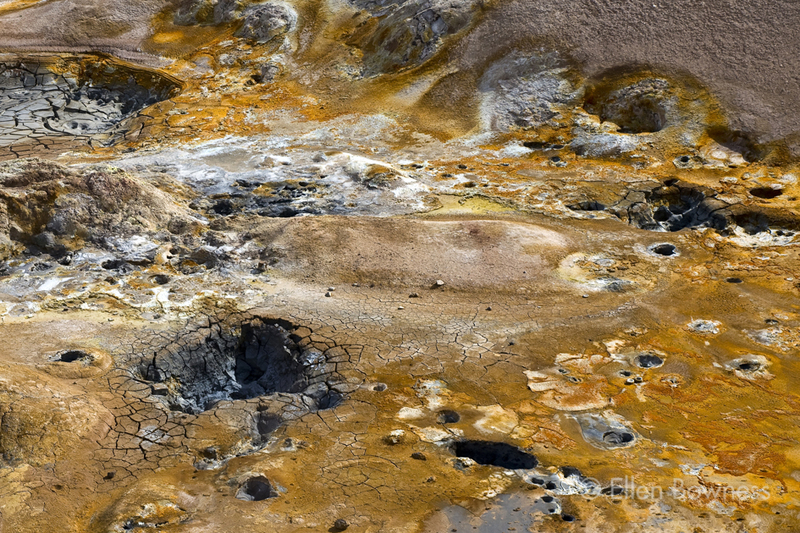 Namaskard – a large geothermal area of bubbling mud pools and solfatars, just east of Myvatn. Krafla – more geothermal entertainment, near Namaskard. Dettifoss – Europe’s most powerful waterfall, to the east of Myvatn. Godafoss – impressive horseshoe shaped waterfall. Barnafoss & Hraunfossar – two waterfalls close together near Reykholt. Hraunfossar is the more attractive and is long and low with beautiful blue water. Dynjandi – huge cascading waterfall in the West Fjords area. Kirkjufell – iconic conical mountain with a handy waterfall for foreground, on the Snæfellsnes Peninsula. Gunnvuher – geothermal area with bubbling mud pools. 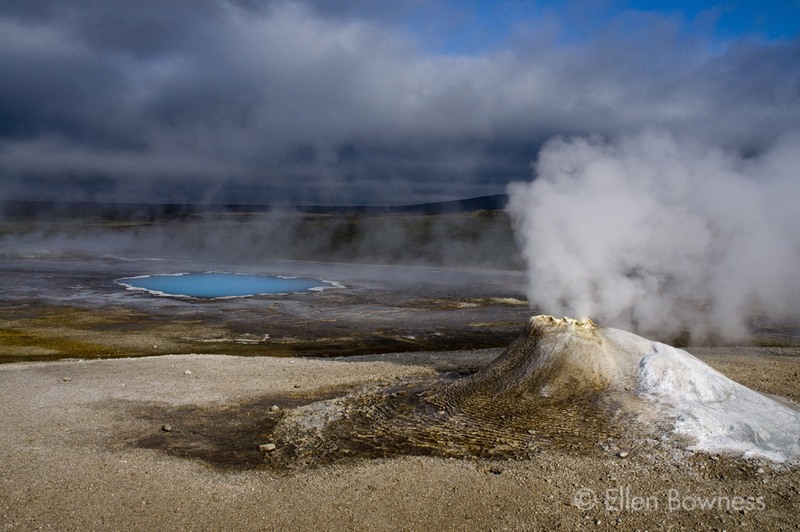 Seltun / Krysuvik – another geothermal area with bubbling mud pools. Blue Lagoon – plenty to shoot even if you don’t pay to go in for a swim. Landmannalaugur – a breathtaking area in the Highlands filled with unusually coloured mountains. Hveravellir – a geothermal area on the F35 route.